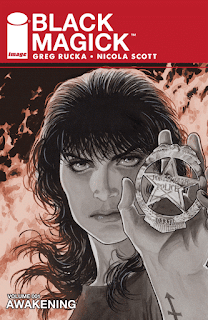 That Greg Rucka has a new police procedural comic should be headline enough. To read Black Magick Vol. 1: Awakening is to get a glimpse maybe what Gotham Central might have become has Crispus Allen's turn as the Spectre been planned from the start and Infinite Crisis not brought things to a screeching halt -- a police book with supernatural trappings a la Rucka. Black Magick is interesting and shows plenty of potential, though Awakening is mostly set-up; when I finished the first collection of Rucka's Lazarus, also from Image, I felt I'd read considerably more of a complete story than I had here. Awakening's first issue is perfection, by Rucka with art by Nicola Scott and colors by Scott and Chiara Arena -- the colors being almost a character in the story themselves. Rowan Black is a sharp police detective but she's the kind of misfit whose cell phone goes off in her witches' coven circle, pulling her away to a hostage situation. In a fraught 28 pages, Black is drawn further in until she becomes hostage herself. The story is told almost entirely in black and white, until a final jarring splash of color when Black must use her magic to protect herself. The hint of magic buttresses the pages of police work, not the other way around, reminiscent of course of the superheroics around the edges of the procedural in Gotham Central. There is plenty good police stuffs in the rest of the book, including an encounter with IAB, some evidence tampering, and the mystery of who murdered and mutilated a vicious killer. Unfortunately, this begins to take a back seat to the magic doings as the story goes on; the book's climax, for instance, involves Black in a "mindscape" fighting some sort of banshee, which surely has its time and place but wasn't as riveting as the hostage situation that started the book. Also the investigation of Bruce Dunridge's murder doesn't really advance by the end, short of an interview with his victim's family that works in the procedural drama, but stalls the story a little in that we know magic was involved and they had nothing to do with it. Also, though Black and her occult friend Alex have specific suspicions as to whose behind both the hostage-taking and Dunridge's murder, Rucka withholds most of the details from the reader. We intuit that there's a rival organization of some sort called Aira that Black suspects is to blame, but there's a lot of "it's starting again" business, especially when Rucka introduces Alex in the second chapter, that seems unnecessarily vague. Modern witches being hunted is not necessarily reinventing the wheel, and I think Rucka could have built more emotion with clarity than with mystery. Further, Rucka and Scott do a fine job suggesting Black's isolation through gaping, empty panels, but I left the book without feeling I knew a lot about Black either, aside from seeing in her some of the same burdensome preoccupation inherent in Renee Montoya, Kate Kane, or Forever Carlyle. I did like Rucka foiling expectations in that the Aira is apparently not behind the attacks on Black (Aira, if I'm reading between the lines correctly, being a non-magical paranormal watch group akin to Anne Rice's Talamasca). My suspicion is we'll see Black teaming up with her old enemies against a common foe before too long (I also think, if reincarnation or immortality plays a role in the story, maybe Black has some relation to her partner Morgan Chaffey). But Rucka doesn't make it easy on the reader -- the third chapter introduction of the group includes a page entirely in German, which (I found out after the fact) does not say anything terribly important, but does serve to distance the reader from Aira, delaying our understanding of them as good guys later on. Scott and Arena work in a muted tone of grays that's essentially black and white; it gives the story the intended noirish feel but also, in some of the lighter scenes in the police precinct, some reminiscence of a 1940s movie (which may or may not be the same thing). The use of color only for the magic aspects has practical as well as aesthetic purposes; it helped me track, for instance, the fake lighter in the evidence scene. I did occasionally find the coloring of the outdoor scenes too muted (and there's certain men that Scott draws -- Chaffey here, Alan Scott in Earth 2 -- that look a mite too similar to one another), but there's been interesting choices made here and I'm curious how they'll play out. Again, when I first read Greg Rucka's Lazarus, I knew I was hooked; Black Magick Vol. 1: Awakening is more of a slow build. I'd come back again to see where Black Magick goes, but as yet I don't consider it essential reading. I do like that Rucka and team are playing with a book's colors, reminiscent of Rucka's work with Shawn Martinbrough on Detective Comics so many years ago. The best takeaway here, not surprising, is what a good team Rucka and Nicola Scott make, and I remain very excited to read their work on Wonder Woman when that "Rebirth" collection finally arrives.